When the NBA Finals ended in disappointment for the Miami Heat, no one thought that this sort of cataclysmic fall would happen to the organization, but in the weeks since, superstar LeBron James has opted out of his Miami contract and moved up north to rejoin his hometown team, the Cleveland Cavaliers. This move will have a very dramatic effect on the entire league and has now ended the budding dynasty for the Heat. However, it also presents an opportunity for James to do something miraculous for the city of Cleveland: to bring it a major sports championship, a thing not accomplished since the 1964 Cleveland Browns, in a time before the Super Bowl even existed! For a city to go this long without any sort of title is quite appalling, and this inevitably brought so much pain to Cavs fans when LeBron deserted the team for Miami in 2010. But with his return, the league’s best player could help lead the city back to glory. There is no doubt about it, LeBron James is the face of the NBA, and he immediately makes the Cavaliers contenders. Also, he isn’t coming to a broken team without a hope for anything. With several recent top draft picks, the Cavs contain incredible young prospects like Anthony Bennett, Kyrie Irving, and Andrew Wiggins. While the jury remains out on both Bennett and Wiggins, Irving is already a 2-time NBA All-Star and will likely become a top contributor alongside James. And this will put LeBron James right into the role that he is ready to take on, that of team leader. While he was the main ingredient for the “Big 3” in Miami, many felt that Dwayne Wade was really the vital cog of that team, as he had earned an NBA Championship years before James ever came to town. In Cleveland, it will be all about LeBron helping educate these young stars and creating a new power team in the Eastern Conference. LeBron James has set about building a project. He saw that time was nearing the end in Miami and he wants to do something great for his hometown. How can anyone argue against what he’s shooting for? Sure, it will take time and he’ll probably take a lot of criticism if the first few seasons don’t go exactly according to plan, but if LeBron can tough it out and deal with the growing pains of this young supporting cast, the Cleveland Cavaliers could very well become the best team in the league within 3 or 4 years. The challenge with LeBron will be what happens if these youngsters never materialize? No sport experiences draft busts like basketball, and should neither Bennett or Wiggins succeed, life could become hard with the Cavs. Recruiting top caliber players to Cleveland will be nearly impossible with competition from teams like the Los Angeles Lakers and New York Knicks in the fold. If LeBron is stuck with a mediocre squad in a year’s time, he could opt out of this contract and move on. However, I don’t think this will happen. While this project may not enable James to equal Michael Jordan in titles won, he could build a miraculous success for his hometown team and officially become a hero in Cleveland, helping the city to win its first sports title in over a half century! 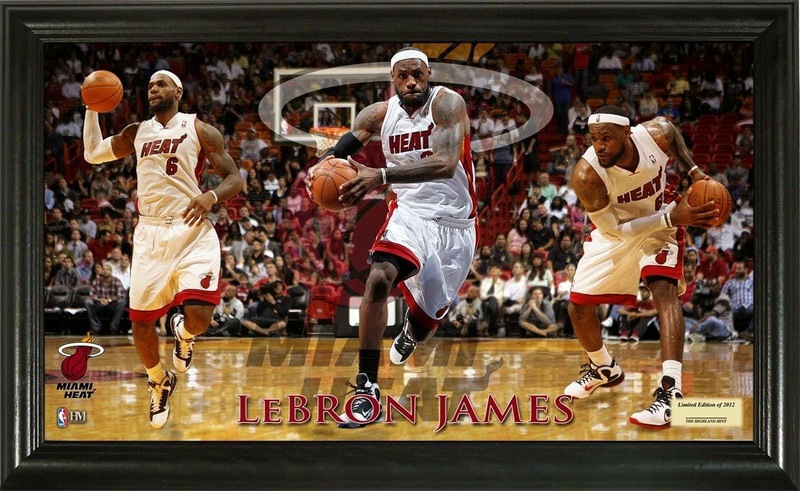 Whether you root for the Cleveland Cavaliers, Miami Heat, or another NBA team, you will find your next sports collectible at AAA Sports Memorabilia. We have a great selection of autographed sports memorabilia along with non-autographed officially license sports collectibles. We add new products regularly so visit us often at www.AAASportsMemorabilia.com.